More than a “how-to” book! Kudos to Anne Fletcher as she once again does what she does best, weaving weight management best practices with personal testimonies. Loved this book. Very clear and easy to read, we just started incorporating the ideas but I have high hopes for the process. It keeps things realistic which is a nice change. I bought this book because my granddaughter is becoming overweight and I want to help her and my daughter to work on this problem. A wonderful, quick, and captivating read! This book belongs on the bookshelves of teens, families, AND healthcare practitioners! Fabulous! 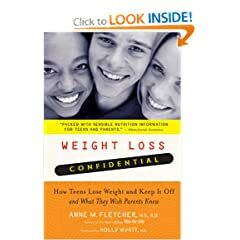 I enjoyed the easy to follow, practical tips, and guidance on helping an overweight teenager lose and maintain their weight. I love this book. It has solid science, and the real-world stories of teens who actually made healthy changes are motivating to anyone – teen or parent. Ms. I work as a nutrition therapist with overweight teens and teens with eating disorders. There has been a need for a book like this for a long time.